Alopecia areata (AA) has a variable course and uncertain natural history. All patients of alopecia areata may not require treatment. About 19% patients of alopecia areata will progress to extensive alopecia (alopecia universalis, alopecia totalis, ophiasis and patients having more than 50% scalp involvement). Systemic corticosteroids in daily therapy, mini-pulse therapy, and pulse therapy were used in the past with varied success from 36 to 75% in various studies. ,, Winter et al.,  reported the occurrence of side effects such as striae, acne, obesity, hypertension while using alternate day prednisolone. The author concluded that alternate day therapy does not appreciably alter the course of AA. However Sharma et al.,  have used oral mini-pulse dexamethasone twice weekly in extensive alopecia and found this treatment to be safe and effective for cosmetically acceptable regrowth in 63% cases. With this existing understanding of alopecia areata, we embarked on a study using a combination of oral bethametasone mini-pulse, topical minoxidil and short contact anthralin in treatment-resistant, extensive alopecia areata. The rationale behind choosing this regime was to use oral bethametasone pulse to halt the progression of disease activity, at the same time topical minoxidil and anthralin were added with the intention of initially supplementing the effect of oral steroids and later minimizing relapses on discontinuation of oral steroids. Fifteen patients, 10 females and 5 males, aged 7 years to 45 years with extensive alopecia attending the hair clinic in our hospital from 2008 to 2010 were recruited for this study. History of diabetes mellitus, peptic ulcer, psychosis, severe hypertension, cardiac failure, acute and chronic infection, nephropathy, or endocrine disorder was ruled out in our patients. The duration of disease at the time of presentation ranged from 3 to 10 years. All patients had received various modalities of treatment in the past in the form of steroid pulse therapy, dinitrochlorobenzene, tacrolimus or herbal products with poor/partial response or relapse after discontinuing therapy. A wash out period of six months was allowed before starting these patients on the new study regime. Of the total 15 patients, 7 patients were receiving some alternate form of therapy at our center itself for a year with poor/partial response or relapse on tapering therapy or developed significant side effects of therapy necessitating withdrawal of therapy. All of these 7 patients were then treated with the study regimen of combination therapy. Of these 7 patients, note worthy was a nine-year-old girl with Alopecia universalis who was treated with topical dinitrochlorobenzene. However, she had complications of the treatment in the form of repeated scalp abscesses, erratic response in the form of either profound dermatitis post application or no reaction at all. Another 27-year-old man was treated with 100 mg once a month dexamethasone intravenous pulse therapy for a year with good response but complete relapse on discontinuation of treatment. Two of the fifteen patients had elevated levels of thyroid auto-antibodies with a normal level of T 3, T 4 and thyroid stimulating hormone. One of the patients had coexistent stable vitiligo. There was no personal history suggestive of atopy in any of the patients. The baseline investigations like complete hemogram, blood sugars, liver and renal function tests, chest X-ray and ophthalmological examination were performed. All patients were started on oral betamethasone mini-pulse (0.1 mg/kg/body weight on two consecutive days per week) along with 2-5% topical minoxidil and 1.15% anthralin cream. Oral minipulse was continued till the patient achieved a cosmetic response and then it was maintained for 6 to 9 months depending on the response attained. The oral minipulse was gradually tapered by 20% every three weekly after cosmetic response and then stopped. If response was not seen in six months then oral steroids were stopped. One milliliter of topical minoxidil was applied to the affected scalp and then was reapplied 12 h later. Anthralin cream was applied daily in the night 2 h after the last application of minoxidil for 10 min (contact time) initially, and thereafter the contact time was escalated every three weekly till mild erythema was seen. The contact time responsible for the mild erythema was maintained throughout the study period. Maximum contact time achieved was 1 h. The patients were instructed to clean the treatment area with mineral oil and water after the specified contact time. Topical minoxidil and anthralin was continued as maintenance therapy after stopping oral steroids. Maintenance therapy included tapering the number of applications of topical minoxidil to once a day, as well as anthralin to once or twice weekly. Response was assessed at monthly intervals using a severity of alopecia tool (SALT) score. Response was defined as growth of terminal hair at the treatment site. Response was classified as cosmetically acceptable where regrowth of hair obviates the need of a wig/cap, partial response where dense patches of terminal hair are seen and does not obviate the need of a wig/cap, non-responders or failure defined as no growth or vellus hair even after six months of therapy. Of the 15 patients (age range 7-45 years) recruited in the study, 10 patients were in adolescence age group. Of these 15 patients, 7 had alopecia universalis (AU), one alopecia totalis (AT), 4 ophiasis, and 3 had more than 50% scalp involvement [Table 1]. Out of eight patients with AU/AT, two attained cosmetic response as early as three months, two at six months and one had partial response. Cosmetic response was attained in all four patients with ophiasis and all three patients with more than 50% scalp involvement at six months [Table 2] and [Table 3] [Figure 1]a-b and [Figure 2]a-b. All responders maintained their response without systemic steroids beyond 12 months. The total duration of oral minipulse administered to all responders was 9-12 months only. Among a total of twelve responders (80%), two with AU showed a mild relapse and were effectively treated with intralesional steroids. Side effects to therapy were mild and reversible. Side effects like folliculitis, persistent erythema, hyperpigmentation were seen in two patients. All the three patients who did not respond had AU and disease duration of 8 to 10 years. Fiedler et al.,  used topical minoxidil and anthralin in 51 patients having extensive treatment-resistant alopecia and cosmetic response was seen in 11% with maintenance in 80%. It was hypothesized in this study that combination of topical anthralin and minoxidil was synergistic and more effective than monotherapy alone. Minoxidil has been shown to stimulate hair regrowth in androgenetic alopecia and alopecia areata. The mechanism by which it stimulates hair regrowth is unknown, although emerging evidence suggests that direct follicular effects are likely to be present. Anthralin elicits hair regrowth because of its irritant properties. The nature of its irritant mechanism is unknown and is obscured further as other irritants like croton oil do not elicit hair regrowth. There is no evidence to suggest direct follicular effects of anthralin. Sharma et al.,  administered oral prednisolone as pulses in doses of 300 mg at 4-week intervals, for a minimum of 4 doses or until cosmetically acceptable hair growth in 24 patients and eight patients separately received 1000 mg prednisolone pulses. Out of 32 patients evaluated, only one patient out of 5 patients of AU/AT attained a cosmetic response with oral pulse at six months and 2 patients (AU and AT each) with 1000 mg pulse at nine months. In another study, Sharma et al.,  reported a cosmetic response in 16 (63.3%) out of 30 (25 extensive alopecia areata, 5 alopecia areata) patients at five months treated with dexamethasone oral minipulse. However, in this study there was no patient with AU/AT. Khaitan et al.,  illustrated a cosmetic response in 7 (43.7%) out of 10 patients with AU/AT at the end of six months of treatment with betamethasone oral minipulse. Relapse was seen in one patient after stoppage of therapy. In our study, cosmetic response was seen in 2 of 8 AU/AT as early as three months and another two patients at six months. This response was attained faster than the previous reported studies. All 12 responders have maintained a response at the end of one year after stoppage of oral steroids. Side effects were seen in only two patients and were mild and reversible, in the form of local scalp irritation. 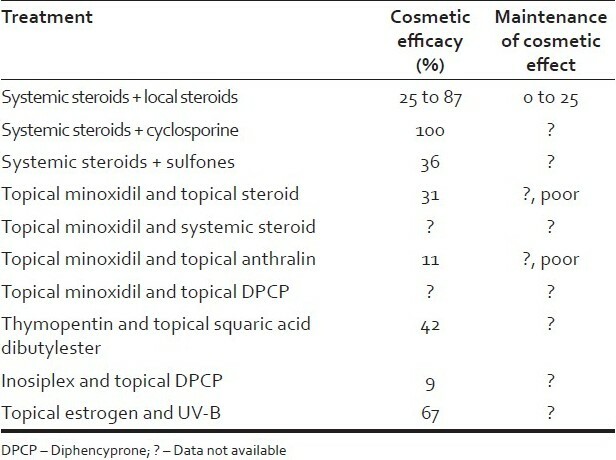 Conventionally a combination of anthralin and steroid is not recommended based on the logic that steroids would decrease the irritation potential of anthralin, and thereby its efficacy. However, in our study, all the patients in spite of being on oral steroid had developed local erythema and scalp irritation on anthralin application. Steroids have been useful in the treatment of alopecia areata. However, daily doses of steroids have significant treatment-related side effects. On the other hand, alternate day steroids or pulsed dosing may be inadequate. Therefore, the combination of topical minoxidil with anthralin along with oral mini-pulses of systemic steroid used in our study yields effective response, while being safe at the same time. Maintenance of cosmetic response can easily be achieved with only topical minoxidil and anthralin while gradually tapering and finally discontinuing oral steroids. We propose that this combination therapy would provide a new approach in treatment-resistant, extensive, long-standing alopecia areata. 1. Sharma VK, Dawn G, Kumar B. 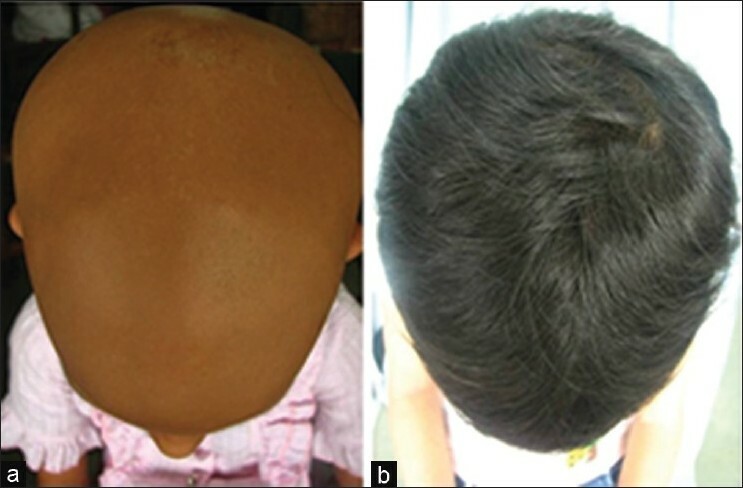 Profile of alopecia areata in northern India. Int J Dermatol 1996;35:22-7. 2. Sharma VK. Pulsed administration of corticosteroids in the treatment of alopecia areata. Int J Dermatol 1996;35:133-6. 3. 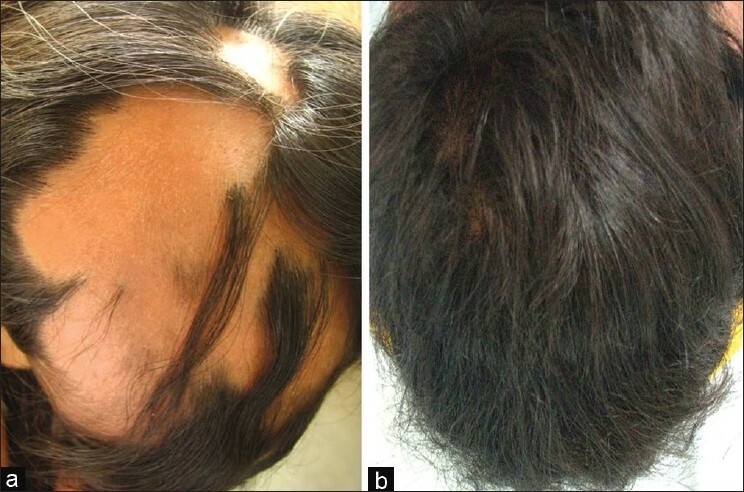 Sharma VK, Gupta S. Twice weekly dexamethasone oral pulse in the treatment of extensive alopecia areata. J Dermatol 1999;26:562-5. 4. Khaitan BK, Mittal R, Verma KK. Extensive alopecia areata treated with betamethasone oral miinipulse therapy: An open uncontrolled study. Indian J Dermatol Venereol Leprol 2004;70:350-3. 5. Winter RJ, Kern F, Blizzard RM. Prednisone therapy for alopecia areata. A follow-up report. Arch Dermatol 1976;112:1549-52. 6. Olsen EA, Hordinsky MK, Price VH, Roberts JL, Shapiro J, Canfield D, et al. Alopecia areata investigational assessment guidelines-Part II. National Alopecia Areata Foundation. J Am Acad Dermatol 2004;51:440-7. 7. Fiedler VC. Alopecia areata: A review of therapy, efficacy, safety and mechanism. Arch Dermatol 1992;128:1519-29. 8. Fiedler VC, Wendrow A, Szpunar GJ, Metzler C, DeVillez RL. Treatment-resistant alopecia areata. Response to combination therapy with minoxidil plus anthralin. Arch Dermatol 1990;126:756-9. Miteva, M. and Tosti, A.